All real estate agents are on a quest to generate leads. One of the most effective ways to do so remains real estate marketing flyers. With just a bit of creative thought and a system to create your design, your real estate marketing flyers can become your best lead driving tool. Here are three techniques for you to try with your next flyers. Use your flyer to give a preview of the property, but hold back on some of the details. For example, don’t list the price, and include photos that leave them wanting to see more. Being just a bit mysterious will pique your potential leads’ interest. Drive engagement by having your call to action direct people to contact you by phone, text or email. If you’re contacted by phone or text, ask for an email address to send the property’s details to. You’ve now captured a new lead’s phone number and email. How easy was that? Interested in more properties like this? Email me today and use the subject line “I want to see more properties” and I’ll send you a list of some great properties I’m sure you’ll love! Everyone loves wondering what gems might be waiting for them, and they’ll be intrigued enough to take action. Open houses are a great opportunity for you to showcase a property as well as your expertise and exceptional customer service. Capture all types of new leads—both interested buyers and curious neighbors—by using a call to action on your flyer that asks them to text you to receive notification of details for your next open house. When you receive their text, follow up by phone and offer to schedule an individual showing. Mail your open house invitation to all the neighbors and include some of the above creative ideas. 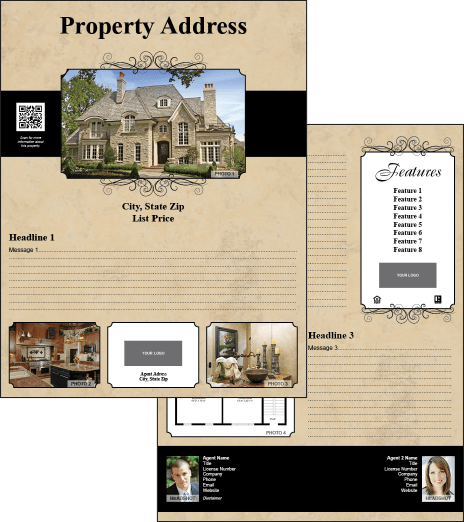 Are you ready to take your real estate marketing flyers to the next level?